I’m shocked to find that Kevin is shocked. That’s pretty much the standard explanation — at least, a partial one — for why lenders became willing to take on so much risk. Massive house price depreciation had pretty much dropped out of their models, which mostly focused on prepayment risk. ….That’s not to excuse the bankers for not trying; some allowance for the risk of a broad price decline would have been better than none. But I’m not sure that it would have done much to alter their lending habits. Going on historical data, the risk of a huge price drop within the average lifetime of a mortgage (which is less than ten years), would normally have been very small…. I’m not so sure about this. Remember: Wall Street is the home of the quant jocks these days. If they could model the fantastically complex derivatives that they routinely wrapped around mortgage securities, they could certainly have modeled this if they’d wanted to. It wouldn’t even be that complicated compared to a lot of the stuff they do on an everyday basis. And as for the risk of a huge price drop being “very small,” surely even a crude model should have shown that risk becoming pretty sizable as prices starting heading into the stratosphere? There were certainly an awful lot of inputs that suggested it. I don’t think Megan and I are actually disagreeing an awful lot here, but I still think this deserves some pushback. 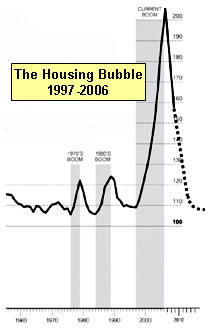 Bubbles aren’t always as obvious as they seem in hindsight, but this one got too big to ignore as early as 2003-04. Any bank with allegedly sophisticated risk modeling should have been factoring in the possibility of bigger and bigger downsides every month after that.